Director – John Lasseter, Co-Director – Joe Ranft, Screenplay – Dan Fogelman, Jorgen Klubien, John Lasseter, Philip Loren, Kiel Murray & Joe Ranft, Story – Jorgen Klubien, John Lasseter & Joe Ranft, Producer – Darla K. Anderson, Photography – Jean-Claude Kalache & Jeremy Lasky, Music – Randy Newman, Animation Supervisors – Scott Clark & Doug Sweetland, Production Design – William Cone & Bob Pauley. Production Company – Pixar Animation Studio/Disney. Lightning McQueen is the hottest car on the race driving circuit. He looks set to win the Piston Cup but due to his refusal to make any pit stops, his wheels blow out in the last lap and the finishing line ends up being a three-way tie between he and his two closest rivals. It is decided that the Piston Cup will be re-run in California in a week’s time. The first car to get to California is up for a prestigious sponsorship deal. Lightning pushes Mack, the truck that is transporting him, to drive through the night to get to California first. However, Mack falls asleep and the back of the truck is knocked open, spilling Lightning out onto the road in the middle of nowhere. Trying to drive out, Lightning passes through the small town of Radiator Springs. Pursued by the local police car for speeding, Lightning becomes entangled in telephone wires and drags a statue through the middle of the town. He is arrested and sentenced to community service – dragging a paving machine through town to reseal the main street that he tore up. As he grits at his sentence, Lightning comes to discover friendship with the other cars of Radiator Springs and a budding romance with the Porsche Sally. Through this, he comes to understand the virtues of the quiet life and discover that his cocky attitude and desire for fame is not all that he believed it to be. Cars was the seventh film from Pixar Animation Studio. Pixar have become the world leaders in CGI animated films and the company name a household word since they premiered with Toy Story (1995). They have since made the likes of A Bug’s Life (1998), Monsters, Inc. (2001), Finding Nemo (2003), The Incredibles (2004), Ratatouille (2007), Wall-E (2008), Up (2009), Brave (2012), The Good Dinosaur (2015), Inside Out (2015) and Coco (2017), as well as sequels to many of these. 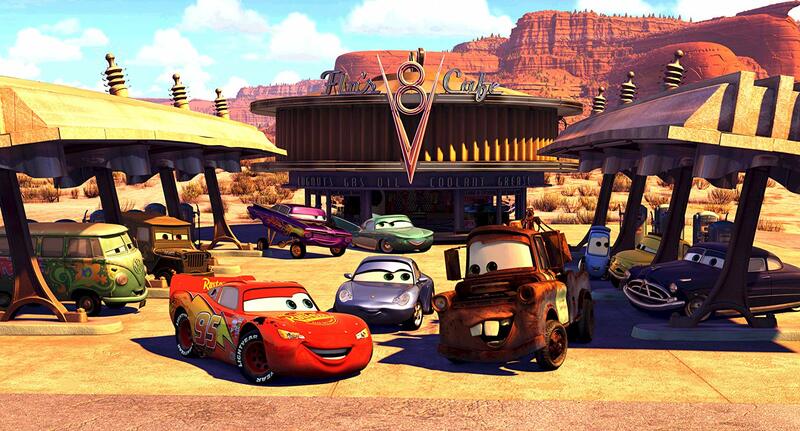 Cars was also the first film to be directed by Pixar founder John Lasseter since Toy Story 2 (1999). Perhaps more significantly, Cars was the first film to emerge from Pixar since the assumption of the CEOship by Apple guru Steve Jobs. Although Cars was made before Steve Jobs took over, one of his first decisions was to delay its release for a year as part of the company’s difficult negotiations over whether Pixar would retain their partnership with Disney. Upon release, Cars obtained mixed reviews to the general effect that it was good but not great and that the charmed touch that Pixar has enjoyed to date seems to have worn off at last. This was born out by the lower box-office that Cars enjoyed in comparison to other Pixar films. (It was still the third highest grossing film of 2006). One did not feel particularly disappointed with Cars. Certainly, it is the longest film that Pixar have made to date, coming in just short of two hours, and the children at the screening I was at tended to squirm through some of the length. Nevertheless, on all counts, Cars proves to be as much a delight as every other Pixar film has been to date. Cars takes the concept that has been played in a number of other films – notably Disney’s long-running Herbie the Love Bug live-action films or the muchly ridiculed tv series My Mother, The Car (1965-6) – of vehicles having personalities. Cars takes this to the logical extent of having vehicles with anthropomorphic features and being able to talk. It is an idea that has such a simple originality that it is a surprise that nobody has thought of it before. There is an enormous amount of fun to be had in seeing the cute twists that Pixar put on the idea – anthropomorphised helicopters and fighter jets; tractors that act as herds of cattle; a crowd of RVs as spectators at the racetrack using their headlights to conduct a Mexican Wave; a shy fire truck that enjoys watering plants. As always, Pixar create an array of distinctive characters that endear considerably, with much of the film being stolen by a cute Italian-accented forklift and a beat-up tow truck with a hayseed twang. There are numerous witty jokes packed away in the background – Jay Leno lends his voice to a chatshow host vehicle called Jay Limo; there is a soundbite from an Arnold Schwarzenegger-accented vehicle that is the Governor of California, which is a Huwvee (a vehicle that Schwarzenegger has become famous for driving). The cutest joke is the one that plays over the end credits where instead of their usual animated outtakes, Pixar have a series of scenes at a drive-in, which are screening such car-themed variants on Pixar’s earlier films as Toy Car Story, Monster Trucks, Inc. and A Bug’s Life (which naturally features a miniature Volkswagen). The funniest part of the scene is John Ratzenberger, who voices the role of the Mac truck, and sits making comments about how they must have cut costs by getting the same person to voice all the roles in the film, which are of course all voiced by him. The lead character Lightning McQueen’s story arc – that of the character who comes from the city life to a small town and gradually comes to find the appeal of the rural life is superior to life in the fast lane – is a familiar one through tv series like Northern Exposure (1990-5) and Doc Martin (2004-9) to name but a couple. Pixar still manage to serve it up anew in a likeable and heartfelt way. John Lasseter, who was inspired by the culture of the US’s Route 66 highway in making the film, adds an interesting social subtext about how interstate highways have ended up causing the death of a number of small towns after they ended up being locked off the main thoroughfare. (Lasseter himself is a collector of classic cars). This is not exactly a new concept – it is at least as old as Psycho (1960), which echoed similar concerns. Here though, one can see that Lasseter has nostalgia for traditional values of Americana and mourns the passing of a cosier, friendlier way of life. It is a point he manages to make with some depth. It is certainly an interesting (and weighty) issue to come in an animated film that is ostensibly for children. Pixar made two sequels with Cars 2 (2011) and Cars 3 (2017). Disney (but not Pixar) later spun the world of Cars off with Planes/World of Cars: Planes (2013) and Planes: Fire & Rescue (2014), which did the same for aircraft.